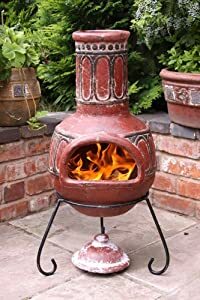 We are reluctantly offering the sought after Basilica Red Outdoor Medium Sized Clay Chimenea for a slashed price. Don't pass it over - purchase the Basilica Red Outdoor Medium Sized Clay Chimenea here now! Make sure you make the most of being in the great outdoors with the Basilica Chimenea. Comes on a wrought iron stand which is powder coated. Basilica has an arches design which was inspired by churches. Includes a matching clay lid as shown.